When 47 GOP senators wrote a letter to Iran warning about their intention to dishonor any nuclear agreement that President Obama may make with Iran, the world was outraged. A spokesman from Iran pointed out that it would be breaking international law for America to dishonor the agreement. However, as any Native American and African American can attest, truce breaking is usual and ordinary in the United States. This is especially true regarding people with mental disabilities. Since it is customary to dishonor agreements made with Americans, can Iran or any other country expect anything more? Which of the following domestic and international laws was not dishonored repeatedly today? United States officials have signed contracts with the American people and the United Nations that regard the rights of U.S. citizens. Failing to honor these contracts erodes America's ability to influence other countries, just as the Vice President said, especially in the area of human rights. Refusal to honor the agreements signed in years past negatively impacts the United States' credibility and global leadership and makes suspect any and all future agreements. 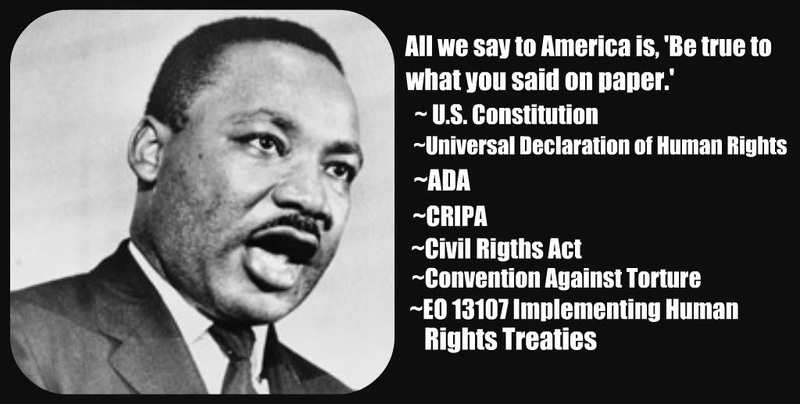 Blaring failures exist regarding the U.S. Constitution, the Universal Declaration of Human Rights, the Americans with Disabilities Act, the Civil Rights of Institutionalized Persons Act (CRIPA), the Civil Rights Act, the Convention Against Torture, and Executive Order 13107, implementing human rights treaties. Ignoring the secret arrest and wrongful death of Larry Neal also violates all laws and conventions intended to protect the rights of Americans who are poor, black, or mentally and physically disabled, such as this man who was held under secret incarceration for 18 days and murdered on August 1, 2003, by yet undisclosed means. Government kidnappings and murders were illegal in 2003. Although extrajudicial assassinations have been legalized in America now, such murders are supposedly reserved for terrorists and cannot legally be used to exterminate the nation's sick citizens like Nazi Germany did. It seems ridiculous to criticize truth-tellers like the 47 senators who revealed plans to break covenant with Iran even before any nuclear agreement is reached. Since truce-breaking is usual and ordinary when it comes to the government's dealings with its own people, how can people in any other nation expect something different? The 47 senators who vowed to break any agreement America makes with Iran gave the world refreshing truth. I solute them for doing that. Repeat of paragraph 1: When 47 GOP senators wrote a letter to Iran warning about their intention to dishonor any nuclear agreement that President Obama may make with Iran, the world was outraged. 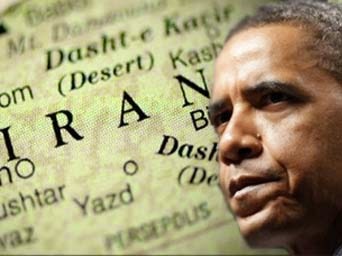 A spokesman from Iran pointed out that it would be breaking international law for America to dishonor the agreement. However, as any Native American and African American can attest, truce breaking is usual and ordinary in the United States. This is especially true regarding people with mental disabilities. Since it is customary to dishonor agreements made with Americans, can Iran or any other country expect anything more? Which of the following domestic and international laws was not dishonored repeatedly today? How can you help? Follow this blog, and share the link to it with your friends. Human and civil rights of persons with mental disabilities in the United States are sometimes treated as being nonexistent. It would be illegal to keep a dog in a tight space 23 hours a day and gas or Taser him for barking. It would be illegal to put a dog in deadly restraint for control. That happens to mentally ill people routinely in the nation's correctional facilities. What happened to Larry Neal? Why are we still asking that question after eleven years? Cover-ups regarding the wrongful deaths of mentally ill inmates are common and vile. Mentally Ill Americans Need Dog Justice. Treat mental illness medically, not legally. Support the H.R. 3717 "Helping Families in Mental Health Crisis Act." The U.S. congressional bill by Rep. Tim Murphy provides for crisis intervention team (CIT) training for police and corrections officers, assisted outpatient treatment (AOT), and other needed changes.